Like many people, my wife wanted to do something to help Japan. She and her friend came up with the idea of a free yoga class to raise a little money and send a message of love and support. 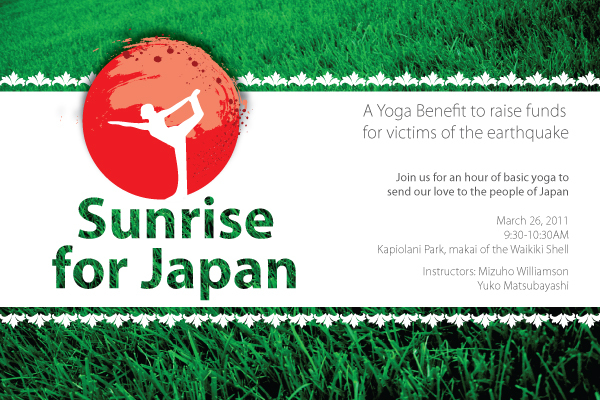 If you live in Hawaii or will be here next Saturday, please stop by Kapiolani Park for an hour of yoga for a good cause. Mizuho will not be collecting donations on site, and there are three ways to contribute: by handing a donation to Mizuho at her weekly Open Air Yoga class, by placing it in the donation box at Yoga Hawaii studio in Kaimuki, or via Paypal. All donations will go to the Japan Red Cross.